Our Volquartsen Custom 22/45 Frame is CNC machined from aluminum alloy. Weighing only 7.1 oz, it is a complete frame with all internal parts including the Volquartsen Accuracy Kit: Extended Bolt Release, CNC machined Target Trigger, wire EDM cut Target Hammer and Target Sear, Titanium Disconnector, Built-in Spring Loaded Magazine Ejector and Extended Safety. 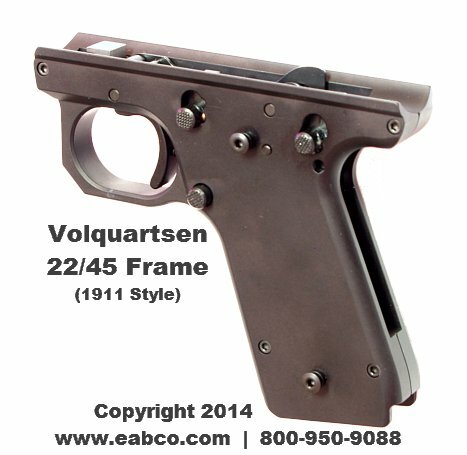 Fits 1911 Style Grips and 22/45 Magazines - This is a complete frame. All you add to complete a gun is your Ruger Mk II, Mk III, or 22/45* upper (barrel, bolt, and mainspring housing), 1911 style grips, and 22/45 compatible magazine. *In order to use this frame on a Mk II/III upper, a new 22/45 mainspring housing, grips and magazine is required. Please note that this frame has the grip frame angle similar to the 22/45 steel frame. Main Spring Housing Sold Separately if needed (Use your 22/45 mainspring Housing). So anyone with a 22/45 light knows all the things that don't work well with the pistol. The trigger pull, magazine release, releasing the slide, and just cheap feel of the factory frame. This frame takes care of it all. Works perfect and as expected. You wont regret it, but its not cheap either. You do get what you pay for. The Volquartsen 22/45 frame is of the highest quality. And the flat face trigger is amazing. Clean break, over-travel and reset adjustments are perfect. Expensive. And worth it. Product lived up to my expectations, fit and finish were perfect. Installation was simple and it literally saved me from having to buy a new pistol. Had the old style 22/45 without replaceable grips, should have upgraded years ago. The Volquartsen frame has all the good stuff and it works as advertised. Got my first Ruger pistol in 1954, don't remember specifics about the model, but it was not a lot of difference in appearance from the Mark III 22/45 that I purchased early this year. It was accurate, reliable, and had a nice trigger pull that I did not have to even think about to shoot. The Mark III 22/45 is a nice idea and has decent sights, is very accurate, (sub 2 10 shot groups at 25 yards with it's favorite ammo) is reliable feels very similar to one of my 1911 variations, BUT has the worst trigger pull of any pistol, rifle, or shotgun that I have ever owned, and over the past 70 years I own, or have owned a BUNCH of firearms. My digital trigger pull gauge showed an average of 7 lbs. 14.2 oz. for 5 test. I removed the junk that would not let it fire unless the magazine was inserted and that reduced the pull to 5 lbs. and 4 oz. Had a shingle hanging gunsmith work on the trigger specifying that I wanted it to be 3 lbs. or less. Got it back after paying him $35.00, trigger still the same. I bit the bullet and purchased the Volquartsen 22/45 frame. Installation was simple. Everything fit as it should. Trigger pull average for 5 test was 2 lbs. 12.4 oz. and never varied as much as 1 oz. This made My Ruger Mark III 22/45 into the gun it should have been in the first place. So, it turned a $ 400.00 dollar pistol into an $ 800.00 pistol, and it's worth every penny. 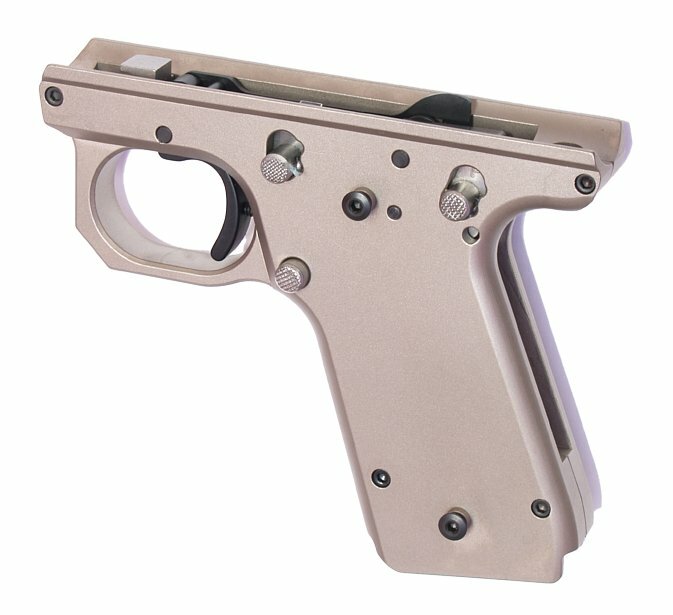 Would I recommend the Ruger 22/45 to a prospective buyer? Yes, but only if you are willing to purchase the Volquartsen 22/45 frame, otherwise, don' t waste your money. Would I purchase the Volquartsen 22/45 frame again? Yes, and I plan on doing so to set up a gun with red dot sights for steel challenge rim fire pistol shooting. The Volquartsen 1911 style aluminum frame has taken the best part of my old Ruger 22/45 pistol - the top half that shoots small groups with cheap Blazer ammo - and upgraded its ergonomics with a full-sized grip and a match grade trigger. The new frame didn't fit the receiver at first but a little patience and the shims supplied by Volquarsen got the two pieces together smoothly without any help from a rubber mallet. Then I added a strip of grit tape to the frontstrap, some new grips (stocks), and the mainspring assembly from my old frame and I was ready to shoot.